Last week I had to make a decision about a matter that I spent much time worrying about a while back, but suddenly, out of the blue the final question was asked and a decision needed to be made. Should it be yes, and continue like before; or no to make that final decision and move on in another direction? Suddenly it wasn’t a decision anymore!? Of course I should move on and let go of the worries, and the thoughts that kept me so occupied for a long time a while back. Suddenly it was clear. 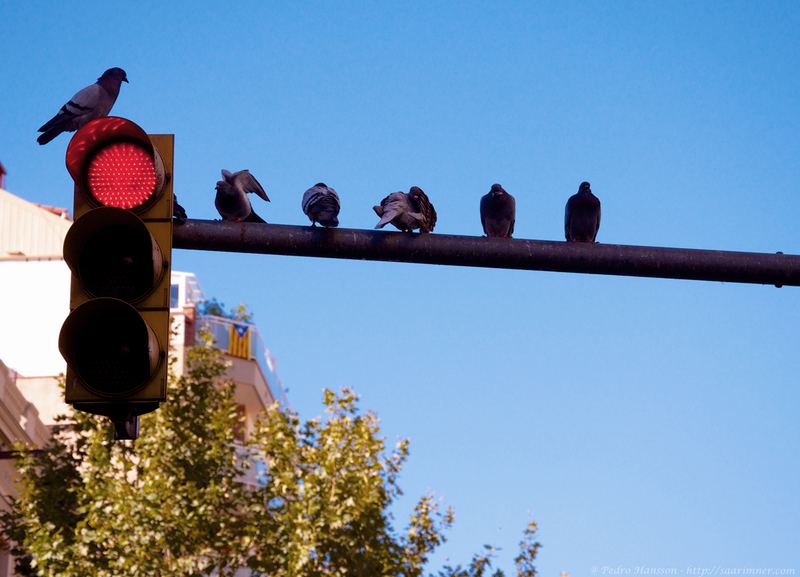 @ Pedro Hansson – Birds on a red light. Not a good picture photo wise. Taken from an open roof top bus in Barcelona. Without the house in the background it may have been ok. But I think the image reflects the topic well – Go, or no go? I was really surprised that the decision was so easy to make because this has been a long process for me, but then I realized one thing I heard a few years back. When you can make a decision without any regrets, you tried everything, you’ve been truly honest to everyone involved and all that’s left is just worrying AND the most important part, you can let go with a smile and wish everyone the best; then you’re finally ready. Totally agree 🙂 Worrying can be really painful, and I think it sometimes also can make the decision process since we’re focusing on the down side of things instead of the possibilities.